Road safety minister Jesse Norman has confirmed that the Government is not minded to re-introduce road safety targets. 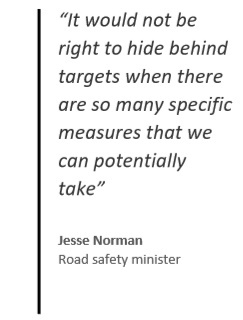 Speaking during the House of Commons debate on 5 November Mr Norman said there was no correlation between countries with road safety targets and good road safety records. He added that rather than targets, the focus should be on specific measures that could be implemented to reduce the number of casualties – such as protecting older and vulnerable road users. Mr Norman said: “The issue of targets is constantly raised with the Government, and this evening has been no exception. “I repeat that some countries with great safety records have targets, and some do not. First introduced in 1987, road safety targets were axed in 2010 – despite being seen by many as having played an important role in helping to reduce the number of deaths and serious injuries on UK roads. 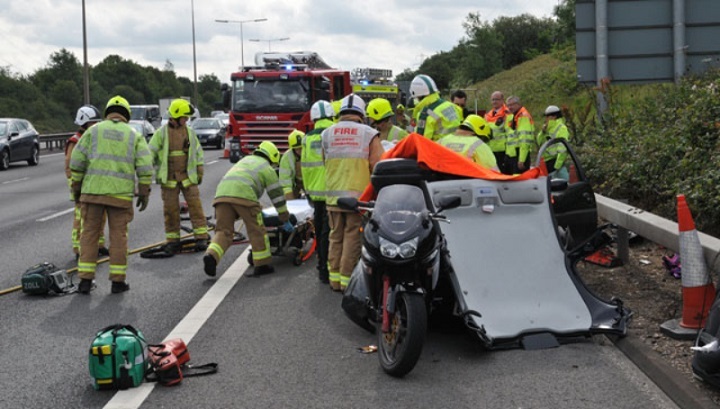 However, with road casualties flatlining since then, stakeholders have repeatedly called for their reintroduction – including PACTS, whose executive director David Davies outlined the case during a one-day conference in London last week. 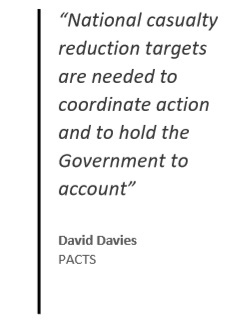 David Davies said: “PACTS firmly believes that national casualty reduction targets are needed to coordinate action and to hold the Government to account. There is no contradiction between having targets and focusing on specific measures. “Indeed, targets would help to ensure that the specific measures were selected on the basis of effectiveness and targeted at substantial casualty numbers, rather than measures which might simply be easy or popular. “If targets are unhelpful, why does the Government have targets in other policy areas and set them for Highways England? Matt Rodda, Labour’s shadow minister for local transport, also supports the re-introduction of road safety targets. During the debate, Mr Rodda said: “The Government scrapped road targets that successfully reduced the number of people killed or seriously injured by a third under the last Labour Government. “The Government tell the shadow transport team that targets do not achieve anything. We disagree. The opposition believe that targets focus awareness and attention and, ultimately, help hold the Government to account.